Danger can lurk around every corner. For many, the mere act of going outside during the evening can seem overly dangerous. Fortunately, there is self defense training that you can learn that will help you to stay away from harm long enough to get help. If you wish to take control of your own safety, you may want to look atself defense training. It is important, though, to realize what this kind of training entails and what it will not allow you to do. This sort of training is not really martial arts, it’s geared towards using your natural reflexes vs a series of highly technical moves. If you have the right attitude and the right state of mind, you can get more out of training than you may ever have imagined. Self defense training is the process by which an individual learns the basics of defending yourself from a real-world attack. The strategies and moves used in the process are drawn from a number of sources, but they all have one thing in common, they are meant to help you incapacitate an attacker and escape long enough to get help. The focus of the training is not on combat, but rather on safety. If an individual knows how to protect himself or herself from attack, his or her own personal safety is in much better shape. While this sort of defense may not always be perfect, it can make a huge difference in your life. It is important to note that self defense is not the same as training in a martial arts. Most modern martial arts focus around competition, usually through the use of judged matches. While self defense systems often draw moves from various martial arts the two sets of systems could not be more different. The point of a martial art is to fight in order to win, while the point of self defense is to fight in order to survive. Mistaking one type of training for the other is incredibly dangerous in the real world, and can put an individual in more danger than if he or she was untrained. No matter what kind of physical shape you may in, it is important to consider a self defense class. 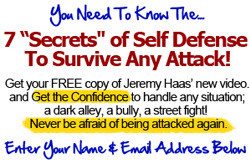 It can help to instill a greater level of self-confidence in you and it can also help you to survive dangerous situations.Self defense training is not for those individuals who want to find a fight, nor is it for those looking for mastery of combat – these systems are made for those who want to be able to avoid dangerous situations and to survive any attack.